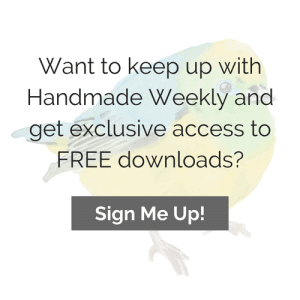 This week I’m sharing one of my favorite recipes with you. 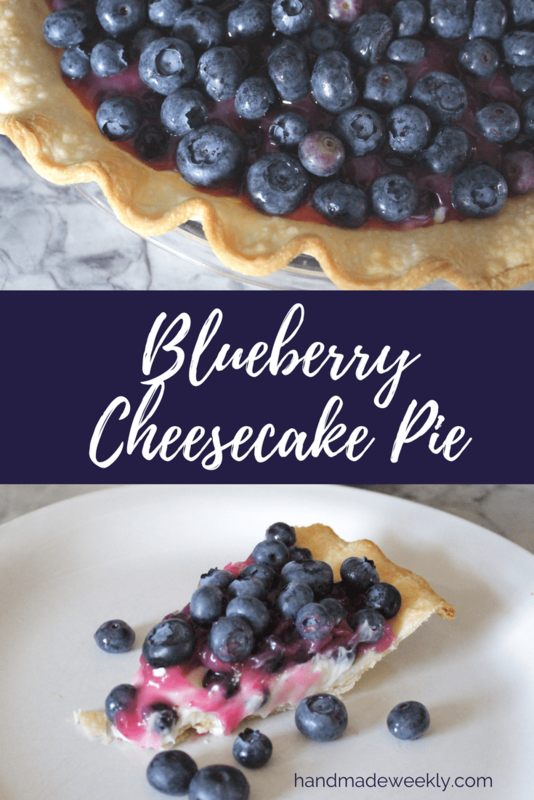 It’s a delicious and SUPER EASY blueberry cheesecake pie. Let me tell you about the first time I had this pie. I was traveling for work last year when one of my coworkers invited me over for dinner at his house. It was such a nice break from my normal travel dinner experiences which typically involve me eating at Panera by myself. I mean, I love Panera, but it gets old when you eat there several times a week. My coworker’s wife made a wonderful meal with an assortment of cheeses for an appetizer, a blueberry salad and then kebabs for the main dish. Just when I thought I couldn’t possibly fit any more food in my stomach, she brought out this pie. I quickly made the decision that I didn’t care how full I was, I was going to eat some of that pie and looking back, I’m so glad that I stuffed my face with more food than any person should eat in one sitting because it was amazing and I now make it all the time on my own! 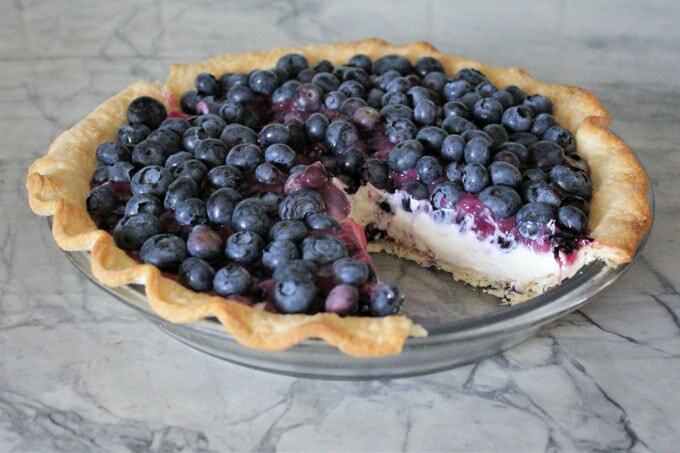 Ok, so now it’s your turn to make this yummy blueberry cheesecake pie. You can download the full recipe card below. * Note that this recipe uses a premade pie crust. You know, the one’s that you find in packs of two in the refrigerated section at any grocery store? If you want to make a crust from scratch have at it but you won’t find the recipe here. I just don’t have time for that! 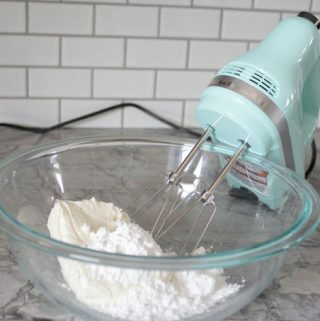 In a medium bowl, use a mixer to mix the cream cheese and confectioners sugar until well combined. 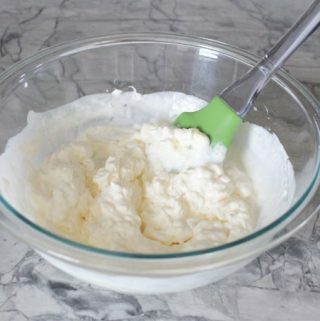 Whip the heavy whipping cream and then fold that into the cream cheese and confectioners sugar mixture. 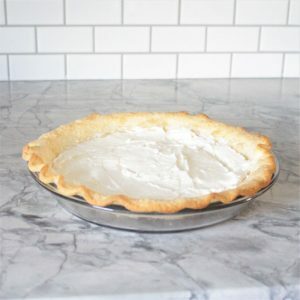 Make sure that your baked pie crust has cooled and then pour the cream cheese, confectioners sugar and heavy whipping cream mixture into the crust spreading it evenly. In a small saucepan, stir the sugar, corn starch, water, juice from 1 lemon and 1 pint of blueberries together. Heat the mixture at medium temperature for about 5 minutes or until the mixture begins to thicken. Then set aside the mixture and let it cool. 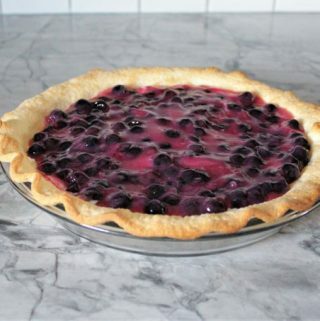 Pour the cooled blueberry mixture into the pie and spread evenly. 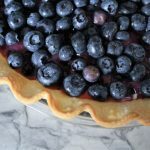 Top the pie with the remaining 1/2 pint of fresh blueberries and then refrigerate the pie for several hours before serving. 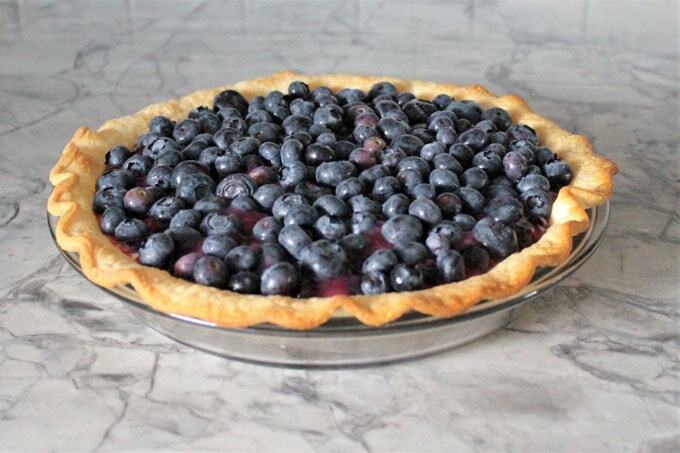 The great thing about this blueberry cheesecake pie is that it looks just as good as it tastes. I’ve made it for several parties and it’s always a hit. Just look at how pretty it is…. That sounds delicious! 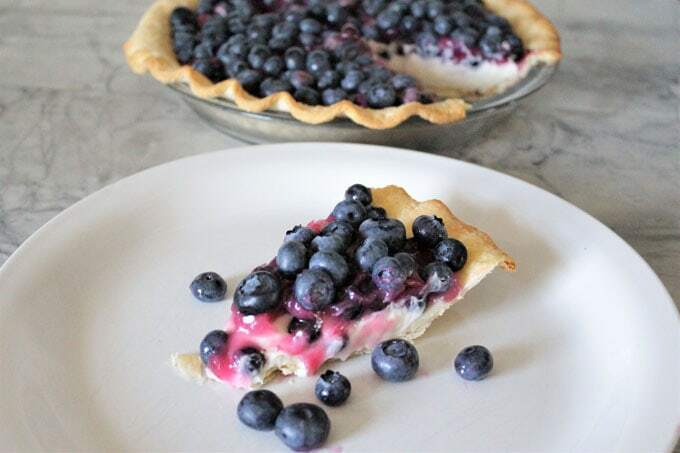 I am often looking for pie recipes that use blueberry but really do not much in the way of cooked berries; this would be perfect with just that hint of cooked and lots of fresh. Pinned. 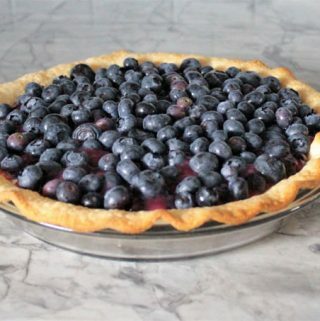 I love the fresh blueberries on it with just a hint of the cooked berries. You get the burst of the berries in every bite! What a pretty pie! And I love the ingredients. Thanks for sharing on Foodie Friday! This looks delicious. I like the regular crust rather than a graham cracker one. Pinning.